My finger aches as I apply a drop of blood to the plastic testing strip. Whilst waiting for the result, a bird call whistles beside me and the beautiful white form of a Great Egret swoops low to the water. The birds are majestic and feel almost alien in a land of huge green forest and rivers shining like black glass. Everything about our surroundings are different and exotic. My girlfriend, Storm, calls up from the front of the boat, ‘Are you still alive?’, I look back to my blood meter showing a much higher number than I would have liked. ‘yeah I’m all good.’ At least nothing an Insulin injection won’t sort out. Looking around from my spot on the top of our two story boat, I grabbed my insulin and gave myself the dose I needed. It had been the first time in a very long time, that I felt strange doing the injection that I am now so used too, but then again, being three days deep into the heart of Kalimantan was never going to feel normal. Travelling with type 1 diabetes is never simple. Having a condition that means every piece of food or drink you consume has to be considered and accounted for, can get tiresome and infuriating. Although much worse, potentially life threatening, if you do not take control of it. For the past three days we have been creeping up the dark waters of the Sekunir River, along the waterways of the Tanjung Puting National Park. Home to some of the world’s last Orangutans. The great red apes are protected in the park, and lovingly guarded by the wardens, locals and international communities alike. Our three day trip along the river, allowed us to visit numerous feeding stations as well as the incredible Camp Leakey. Home of the longest studies into primate anthropology and the cognitive behavioural studies of the Apes. Many of the Orangutans suffer being orphaned due to hunting and deforestation with many of the rescued apes being rehabilitated in the forest that surrounds Camp Leakey. The result is a population of several hundred, semi wild Orangutans, that can be seen from the feeding stations along the camp trails. A perimeter is set around the platforms that allow the apes the space to come down and eat the piles of fruit left for them, without the risk of being too close to the visitors. The trips to these feeding stations are truly remarkable, with the connections between ourselves and the `apes being shockingly close. Its clear to see how we share 97% of our DNA with the Orangutans, which translates directly as ‘People of the trees’. We were lucky enough to see two infant apes as well as the family trees that have been logged by Camp Leakey scientists. As the boat moves to the edge of the river, our guide calls out that he can see his ‘friend’ in the trees. A glimpse of bright red fur and a curious face can be seen studying us from the overhanging jungle. The deck hand comes to the front of the boat with a length of rope, ready to hook around a branch so we can moor in. 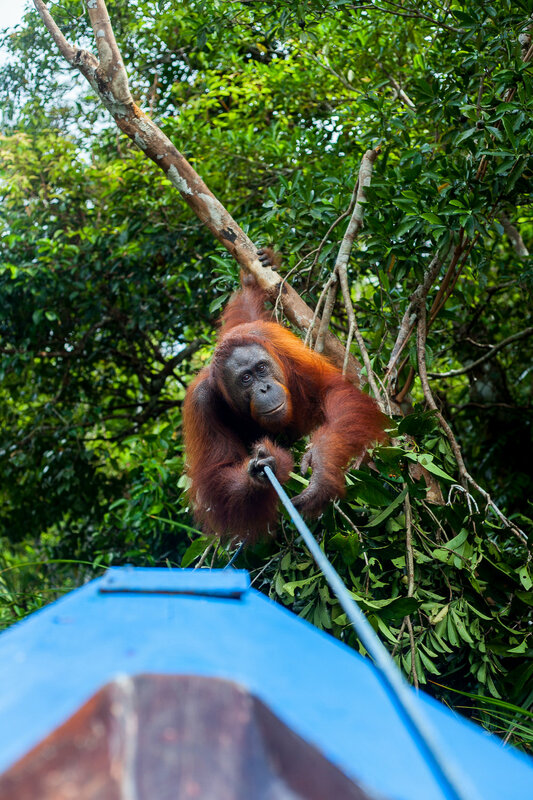 As he gets ready to throw the rope, the branches crack back, and the orangutan comes into full view. He swings to the tree closest to the boat. As the rope is thrown, his hand flashes out and grabs the end intended for the branch he is hanging from. He shifts himself along the branch, and begins to pull. Our deck hand bursts into laughter as he struggles to keep up with the phenomenal strength of the ape. When the rope goes tight between the two of them, the teenager ties the rope off on the side of the boat, and gradually, hand over hand, the ape pulls our boat in closer. The boat touches the river bank, and slowly the red haired stranger drop down onto the front of the deck. Our guide is by our side and explains that the Orangutan’s name is Sweethope. He’s a twelve-year-old male whose territory is the small patch of jungle on the side of the river. However, unlike the other Orangutans from the feeding stations, he is totally wild. In awe and pure shock from the encounter, we sit with the ape for some time. The spark in his eyes is the same as that of a 12-year-old child. The creases in his hands are identical to a humans’, and his character is amazing. Sweethope sits and throws an inquiring glance towards the boats kitchen, our guides give us a piece of cucumber, and with a lot of caution and shaking hands Storm holds it out to him. He takes it gently and just as cautiously as she gives it to him. He retreats back toward his branches, takes a bite, and with an unimpressed look throws the piece of cucumber into the river. Sweethope is obviously not a fan of cucumber. He drops back onto the tip of the boat and we offer him a slice of bread, which goes down much better than the vegetable. Our guide explains that it is very rare that the Orangutan would approach the tour boats, but he has known Sweethope for a long time so thinks the ape recognises him. As Sweethope finishes his bread and moves towards the trees, the sound of another boat engine can be heard approaching. Time to leave. 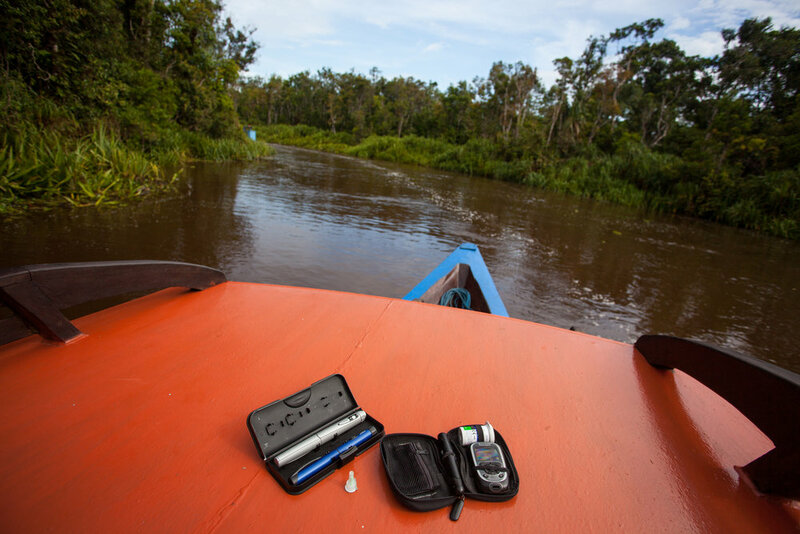 Pulling away from Sweethope’s river bank, I ask our guide about the health and illnesses affecting orangutans. The likes of Diabetes have not been present in the studies of the apes and so far, only the common cold or strains of influenza like symptoms persist. With the destruction of their natural world, or persecutions that the Orangutans face, I am relieved that the condition myself and millions of other suffer from has not developed in a species so similar to ourselves. Despite this incredibly lucky experience, there is the risk that it would make Sweethope rely on food from the passing tour boats, and also risk the safety of others who may meet him. The mooring rope is gathered and we leave our friend to his domain. Looking back as we move away you can still see the spark in his eyes and I hope that Sweethope, like the rest of the Orangutans, is allowed a long life in the forests.